Microsoft publishes recorded sessions and PowerPoint slides of many Microsoft events on Channel 9. Recently TechEd 2014 North America was held in Houston. Over 600 sessions can be watched for free here. What if you could download those sessions so you can watch those while offline? Claus Nilsen wrote a great PowerShell script. It is very easy to use: execute the PowerShell script. You will be presented with a graphical user interface which allows to select the category, author and the event. You can also choose to download the PowerPoint slides, the recorded sessions or both. I will focus on blogs covering infrastructure services like Azure, Windows Server, Hyper-V and System Center. Microsoft is doing a great job by publishing recordings of all breakout sessions on Channel 9. Free to view for everyone. Sessions of May 12 were available within 24 hours. Some of the breakout sessions are even streamed live. For a schedule see here. If you are attending TechEd you can download the PowerPoint slides even before the breakout session starts. Go to http://northamerica.msteched.com/catalog and select the session. Derek Seaman covers many sessions live on his blog . His Twitter account is here. Aidan Finn does live blogging. His Tweets are here. David Hill covers TechEd at his website here . His Tweets are here. WindowsITPro will have many articles on TechEd. VMware vForum is an annual free event for organizations interested in VMware solutions. It is targeted at IT-managers, IT architects and other IT-professionals. Sessions do not go deep dive like at events like VMworld. The event is organized in 24 cities across Europe, Middle East and Africa. Registration, agenda and more here. Actually some cities offer two events: one full day offering an overview of all recent VMware solutions. The other event called the NSX Seminar has a duration of about half a day and has a focus on network virtualization and VMware NSX in particular. The first NLVMUG event was a big succes. Over 600 attendees enjoyed the keynote, many breakout sessions and the different vendor booths. Recordings of the sessions are now available on YouTube. All but one sessions are in Dutch language. The presentations can also be seen via the NLVMUG YouTube channel. Some of the presentations are available for download here. You will need a free VMUG.com account to access these files. 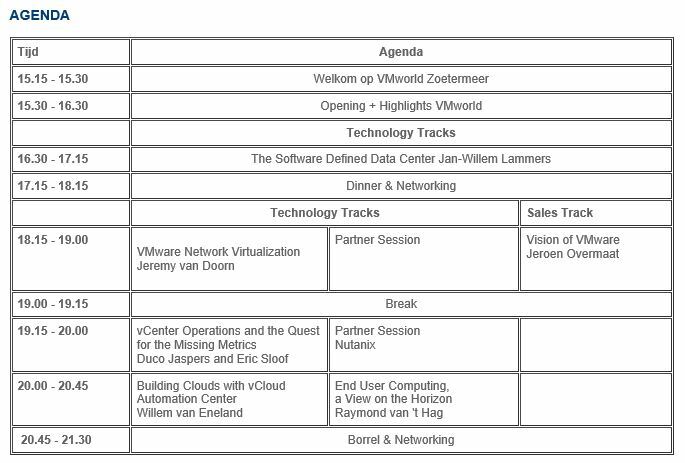 The agenda for the first NLVMUG event has been published. The event is at March 6 in Den Bosch, the Netherlands. The event starts at 08:30 and ends 17:30 with a drink. Location is Conferentiecentrum 1931. There is also a Platinum Sponsor Workshop , Meet the Experts, Genius Bar, Social Media Room and a VCAP Bootcamp. 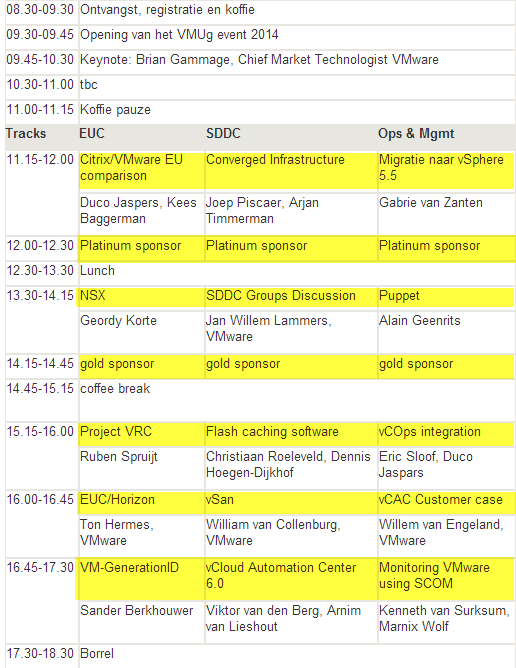 The Belgium VMUG will have its first mini VMworld event at Thursday December 5. 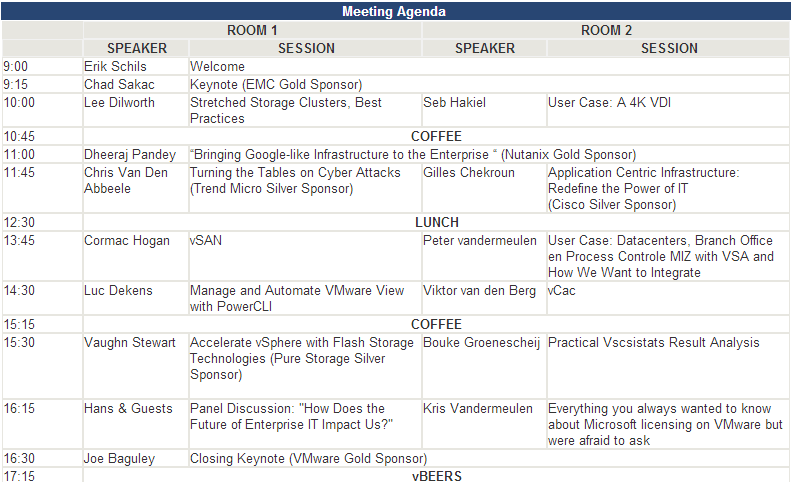 This whole day event has some great speakers of for example VMware, Nutanix and EMC. The location of the event is at Schelle near Antwerp so also conveniant located for Dutch people as well (1,5 hour drive from Utrecht). The event is free. Registration closes at December 4. Below the program of the day. Op 25 september verzorgen VMware en KPN in Zoetermeer een mini VMworld. Er zijn diverse technology sessies en 1 sales sessie. At Gartner Catalyst Conference 2013 in San Diego a very interesting presentation was given by Alessandro Perilli. He currently leads the private cloud computing research in the Gartner for Technical Professionals (GTP) research division. The title of the presentation is “Sizing Up Cloud Management Platforms: Microsoft vs. VMware“. It can be watched online for FREE here. You just need to register. After registration you can watch three sessions for free. This session provides an in-depth comparison between two cloud management platforms (CMPs): Microsoft System Center 2012 Service Pack 1, and VMware vCloud Suite 5.1. The session highlights the key differences between the two CMPs in terms of feature set and technical implementation. Gartner developed a Cloud Management Platform (CMP) assessment tool. This tool evaluates CMP’s using over 200 criteria. Gartner started to assess both Microsoft System Center and VMware vCloud Suite. This research took about 4 months and included many hours spent in homelabs. VMware vCloud Suite scores slightly better, mainly because of its good implementation of charge back and life cycle management. Gartner hopes to force vendors in a certain direction. The criteria in the Reference Architecture Template are a way to lead vendors to adjust their products so it has features the customers really want. This posting has a summary of what was presented in this session. I very much recommend to watch the session yourself. • Which vendor, among Microsoft and VMware, offers an enterprise-grade CMP for large-scale production cloud environments? • What are the key differences in terms of features and implementation between Microsoft System Center 2012 Service Pack 1 and VMware vCloud Suite 5.1? • What weaknesses in each product constrain an organization’s capability to address different use cases for cloud computing? Alessandro starts with a slide showing the results of the assessment. VMware vCloud Suite (light blue bar) has a higher score than Microsoft System Center. But you need to know the context of how the score was determined before jumping to conclusions. Gartner compared the most comprehensive edition available of both products . These are Microsoft System Center 2012 SP1 Datacenter Edition and VMware vCloud Suite 5.1 Enterprise edition. Both Cloud Management Platforms offer a lot of features which are delivered by various components. However not all components are a must in a CMP according to Gartner. In SC 2012 Gartner did not consider Data Protection Manager and Endpoint Protection in the assessment. In vCloud Suite Gartner did not consider Site Recovery Manager and some parts of vCloud Networking and Security in the assessment (because those are part of the virtualization layer). Gartner reviewed the portions of the suites which are marked in yellow in the slide shown below. In the picture below you see VS which stands for virtual services. This are virtual machines. The components shown on top of the virtualization layer are the components Gartner believe are needed to construct a private cloud. The level of integration of the components tells a lot about the maturity of the cloud management platform. The other aspect showing maturity is feature overlap. The more overlap, the less maturity. Gartner sees feature overlap more as a marketing bundle than a cloud management solution. If a product scores 100% in the required features section it is seen as an enterprise product ready for mission critical deployment on a large scale. Large scale means 10.000 managed objects or more. Gartner states the market of CMP is highly immature. There are about a hundred cloud management platform vendors. The framework is meant to push vendors in a direction which Gartner believes is important for its clients. A feature gets a yes/checkmark in the scoreboard if the feature is documented and if the feature is ready to be used out of the box. If a vendor professional services is needed to implement a feature , costing the customer money , it will be documented by Gartner as a no for that feature. So some slides show a NO for some features while the product does have the feature. Only the vendor did not have a written statement to prove it actually works. The foundation of vCAC is based on DynamicOps Cloud Automation Center 4.5 software. DynamicOPS was acquired by VMware in July 2012. The current version of vCAC is 5.1. DynamicOps and vCloud Director used to be competitors. Now they are part of the same suite. Hence the overlap in features. vCAC enables automated provisioning of both virtual machines and physical servers (including the guest operating system). Provisioning of both on-premises and cloud infrastructures is supported. vCAC enables authorized end-users to quickly have access to servers without IT having to perform the provisioning. Provisioning is so reduced from days to minutes. More on vCAC in my post here. In the remaining part of the presentation Alessandro discusses some of the categories and how they scored. VMware has a clear lead in chargeback, life cycle management and service catalog category when compared to System Center. Mind however VMware Chargeback Manager only supports vCloud Director! It does not support VMware vCloud Automation Center. The integration of SC Configuration Manager with other components of SC is not exceptional and there is a lot room for improvement. Lifecycle Management is an extremely important category. The way Lifecycle Management is implemented in vCAC is very wel done compared to Microsoft SC. Gartner is less positive about life cycle management of vCloud Director. 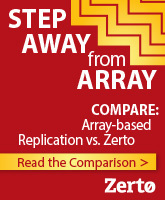 Implementation is done in a totally different way than vCAC. So it is important to understand that difference if you are going to upgrade from vCloud Director to vCAC. You will need to learn again how to manage Life Cycle management. The Platform category has the worst score for VMware because they have no checkmarks in the required features. They do offer most of the features listed in this category. However they get a NO for all features. This is because Gartner only gives a Yes when features applies to all components of the platfrom. Support for mainstream operating systems is not uniform across all components of the vCloud Suite (and in lesser extent in SC as well). Also components of the vCloud Suite use different database technologies. So one component supports Oracle and Progress databases while the other only supports only SQL Server. This means the customer has to manage several database soltions. So because the lack of uniformity VMware vCloud does not get a single Yes in this category. Gartner confirms what former VMware CTO Steve Herrod has told an Italian VMUG meeting in 2012 that the VMware’s cloud infrastructure suite is still only loosely integrated and that the company has plans to do better. Also VMware did not provide written support statement for some of the features in this category. Another requirement to get a checkmark. One of the last slides of the presentation is Recommendations. One of the recommendations is: to take your time. Building a prive cloud is not an easy task to perform. Zero to cloud in 20 minutes as some vendor says is a dream. Organizations will start to implement one or max two components of the suite and add more later on. Give priority to implementation of the features you require. Gartner already has a paper describing SC 2012 . It is titled Microsoft System Center 2012 SP1: In-depth Assessment for Cloud Management. Written by Alessandro Perilli (G00235076). More information on this 69 pages paper here. For VMware vCloud Suite the paper will be released by Gartner around mid august 2013. Gartner sees a growing interest in SC2012 especially by customers of which VMware Enterprise License Agreement (ELA) is about to expire. Those customers are starting to look around for alternatives. Gartner also sees a good penetration of the market of the DynamicOps (now VMware vCAC) product in enterprises. Customers using VMware vCloud Director ran into limitations of the product over time and start looking for alternatives. The long term stratey of cloud management platform vendors is to replace individual components customers already use by their own solutions. Contrary to what vendors tell, the integration with other vendor solutions is not so good. Think about integration of CMP with Servicedesk tooling or Self Service portals. VMware Partner Exchange On Tour, are regional events dedicated to educating and enabling VMware partners for success with VMware. On Tour events take the best sessions from VMware Partner Exchange, our annual global partner conference, and then add some regional focus to provide you with the tools and information you need to successfully sell and deploy VMware solutions in the year ahead. VMware Partner Exchange On Tour is the place for you to learn how to grow and transform your business for the cloud era with VMware. 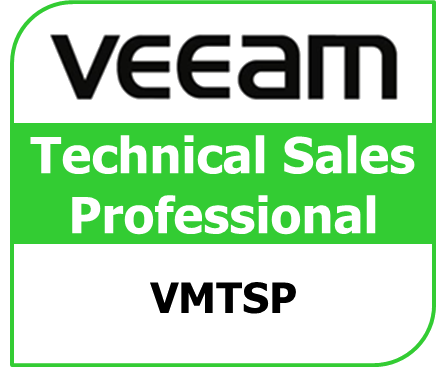 You also won’t want to miss the opportunity to engage with VMware experts locally to learn about new partner programs, explore best practices and understand the training roadmap. Registration for Partner Exchange on Tour 2013 here. Registration is now open for the cities below. Registration for other cities will open soon. 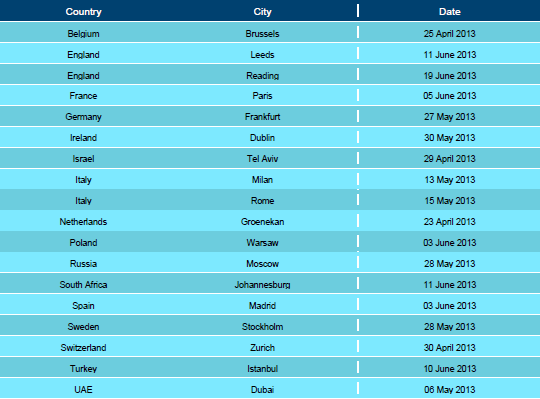 Dates and locations for EMEA countries listed below. VMware Partner Exchange (PEX) is an annual event held in the United States dedicated for VMware partners. It is a kind of small VMworld but more focus on sales, marketing and technical roadmaps. Also some great breakout sessions showing future technology. Lots of partners are for various reasons not able to attend this event. For that reason VMware organizes the VMware Partner Exchange on Tour event in many cities around the globe. This one day event presents the highlights of PEX. Partner Exchange on Tour will visit many cities in Europe, Middle East, Africa, Asia and Pacific. Dates and locations for EMEA are announced and shown below. VMware partners will soon receive more information on how to register. Mind this event can only be attended by VMware partners! Some examples of ITPro sessions are about Exchange, SQL 2012 , Lync, BizTalk and Hyper-V/SCVMM. The slides of the sessions are available online. Most of the slides are in English language. Recordings of the sessions should be made available soon at Channel9. Some examples for sessions on Windows Server 2012 Hyper-V and SCVMM. At November 15 the UK VMUG organized a userconference. The agenda was full of interesting sessions. More presentations are expected to be added later. The Belgium VMUG organizes their annual VMUG Meeting at November 9 near Brussels. The free event promises to be a sort of mini VMworld with well known and respected speakers like Cormac Hogan, Alan Renouf , William Lam, Frank Denneman, Duncan Epping and Mike Laverick all being employees of VMware. There will be also sessions from vendors like Veeam, Symantec and NetApp. Microsoft Worldwide Partner Conference (WPC) is an event for Microsoft partners targeted at sales and marketing staff. Sessions are about Microsoft strategy, how to sell Microsoft solutions etc. Some of the sessions are recorded and available for free viewing here. Recorded sessions held at Microsoft Management Summit 2012 can viewed by everyone for free. Recordings are added daily. MMS is all about Microsoft System Center solutions, deployment tools and other management of a Microsoft infrastructure. It offers over 175 breakout sessions across 5 technical tracks. That is a lot of content to take in! If you are unable to attend the event, or even if you will be there in person, you’ll be able to view any sessions, including keynotes, you may have missed within 24 hours of the live presentation on the Digital MMS site. Access is easy – just log in with your preferred social credentials, find the session you want, and click the Play icon. If you like to download recorded sessions (.wmv format) for offline viewing see this PowerShell script by Stefan Roth. If you like to download the PowerPoint presentations, see this download for a ZIP file containing all PPT files. 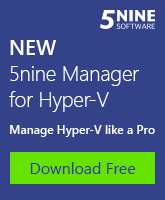 Windows Server “8” Hyper-V revolutionizes the way your IT will use networking and storage. In this session, we cover the changes to the Windows Server “8” Hyper-V storage and networking stack. We dive into the enhancements around the new virtual disk format, integrating new storage industry innovations around offloaded data transfer and large sector disks, and detail the new storage options for Hyper-V including Storage spaces and SMB file storage. We also overview Networking Virtualization, and new networking enhancements including NIC teaming, Quality of Service and the new Hyper-V Extensible Switch. Using Microsoft System Center Virtual Machine Manager 2008 R2 and want to get to know all the new features of System Center 2012 Virtual Machine Manager? Then this session is for you. This session provides a technical overview of Virtual Machine Manager 2012 to kick start your understanding of all new features and take your virtualization management to whole new levels. Relate the major capabilities of Virtual Machine Manager 2012 with your technical pain points in your environment, and learn about the full power that the System Center 2012 can now provide your virtualized environment.